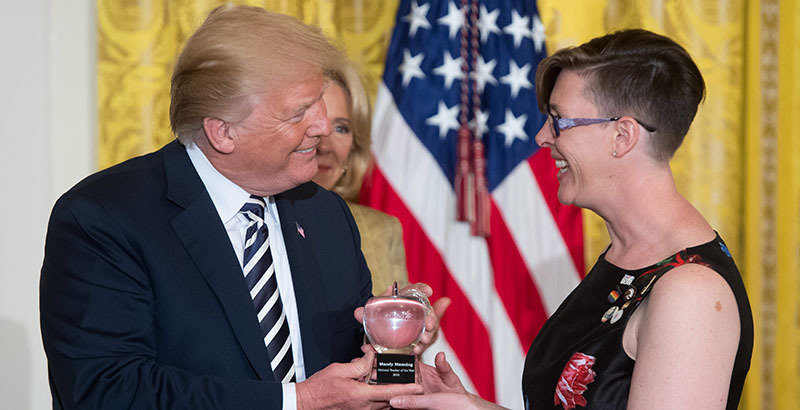 The national Teacher of the Year finalists Wednesday brought messages from — and support for — marginalized students to a White House often seen as hostile to immigrants and LGBT students. Mandy Manning, the 2018 Teacher of the Year, teaches English and math to refugee and immigrant high school students in Spokane, Washington. She brought letters from about 45 students and delivered them to President Trump, who has limited admissions of refugees and cracked down on illegal immigration. “It was very empowering for me to be able to hand-deliver the letters directly to the president himself, and also I got to highlight a little bit of what was in the letters when I gave my remarks,” Manning told reporters on a call Wednesday evening after the White House reception. Trump handed the letters to an aide and asked that they be placed on his desk to read later, Manning said. She also invited the president to visit the newcomer program for immigrant and refugee students at her high school, she said. Manning, along with the three other finalists for the award, said it was an honor to be invited to the White House, and noted that everyone she encountered at the White House went out of their way to make the teachers feel welcomed. Several said a panel the four finalists sat on with Education Secretary Betsy DeVos and Labor Secretary Alexander Acosta was a particular highlight. Trump gave brief remarks honoring Manning and the other finalists. He did not address the immigrant population Manning teaches, according to a transcript released by the White House. Trump said, “That’s great, I like that,” Juravich said. Research from advocacy groups and anecdotal evidence have shown an uptick in bullying, particularly against immigrants, Muslims, and other minority groups, in the wake of Trump’s caustic 2016 campaign and election. One of the letters Manning gave Trump was from a refugee student from Rwanda who has had more “negative experiences” with those born in the U.S. in the past two years, she said. During her speech — which Trump did not attend — Manning highlighted her message “that our students, whether they are immigrants and refugees, members of the LGBTQ community, or even just my girls that I coach every year in basketball, that they are wanted, they are loved, they are enough, and that they matter,” she said. She also wore pins supporting immigrant and refugee students, transgender students, and DACA recipients, she said. A pool report from a journalist in the room also said she wore pins backing the National Education Association and the Women’s March.